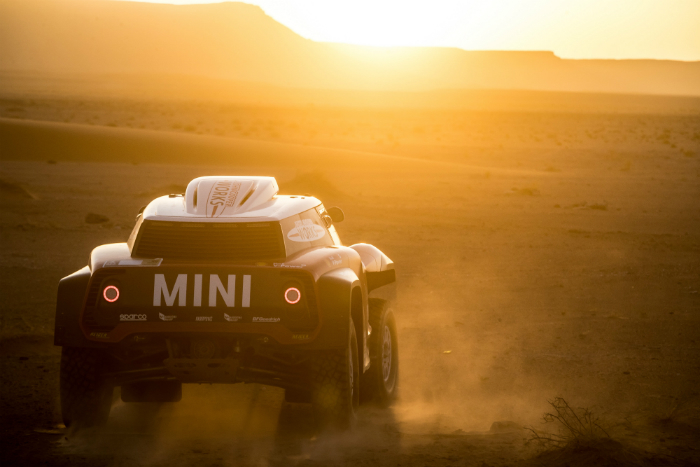 MINI and the X-raid Team have launched into the final preparation phase for the Dakar Rally 2018 with the presentation of their current racing cars. For the first time MINI and X-raid will face the challenges of the most demanding long-distance rally in the world using two different types of drive. In addition to the further advanced version of the all-wheel drive MINI John Cooper Works Rally, which, at its debut appearance, came in sixth overall at the 2017 Dakar Rally, the rear-wheel drive MINI John Cooper Works Buggy will head into the opener stage on 6 January 2018 in the Peruvian capital of Lima. 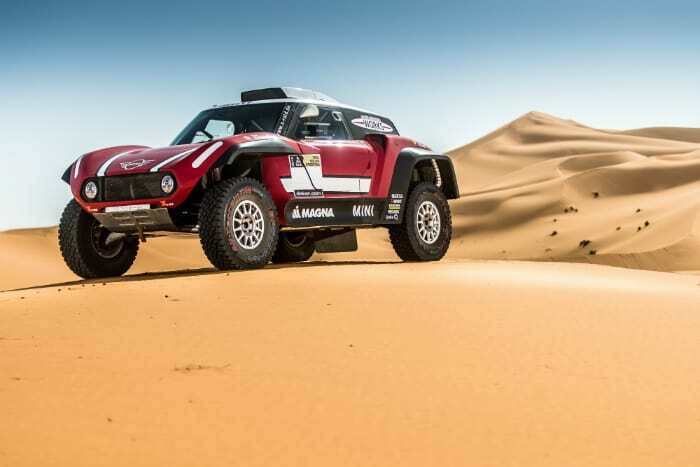 More determined than ever before, MINI and X-raid are aiming to continue their joint success story which brought them four consecutive overall victories from 2012 to 2015. 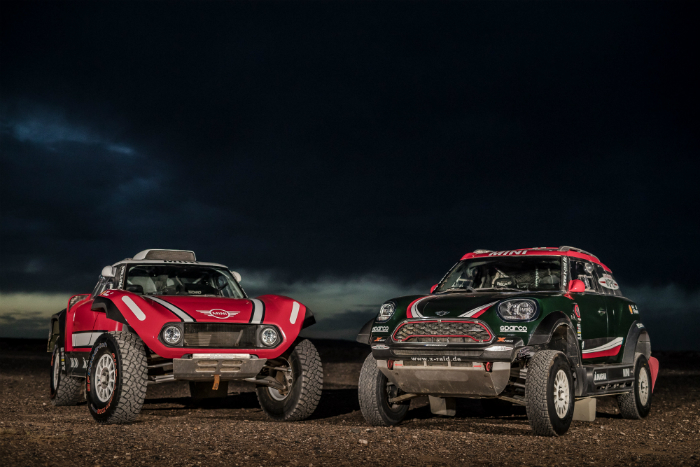 “With these two cars we have the most powerful MINI family that ever raced at the Dakar Rally”, said Sebastian Mackensen, senior vice president of Mini, at the presentation in Paris. The reason why a second vehicle concept was developed lies in the specifics of the Dakar Rally rules, which, in their current form, give two-wheel driven cars certain advantages. The MINI John Cooper Works Buggy is powered by a 3.0-litre inline 6-cylinder diesel engine generating and output of 250kW/ 340hp and a maximum torque of 800Nm. 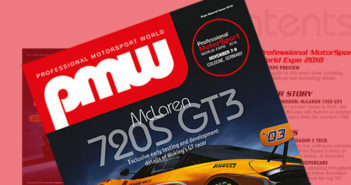 The transmission and drivetrain as well as the engine’s turbocharging technology, which is based on the BMW TwinPower Turbo, have been completely newly conceived. The MINI John Cooper Works Rally uses the same engine. The specially designed tubular steel frame provides maximum protection for driver and passenger in extreme situations. A specifically designed body made of carbon fibre reinforced plastic (CFRP) and Kevlar is stretched over the frame. The authentic buggy-look exterior has been designed in close cooperation with MINI Design and aerodynamically optimised. The new MINI John Cooper Works Buggy has already undergone an intensive test programme over the past months which took it over different types of rally terrain for example in Hungary and Morocco. The targeted advancements for the MINI John Cooper Works Rally, which Argentinian Orlando Terranove raced to sixth place in the overall rankings of the 2017 Dakar Rally, includes a new chassis construction featuring greater suspension travel and weight reductions among other things. 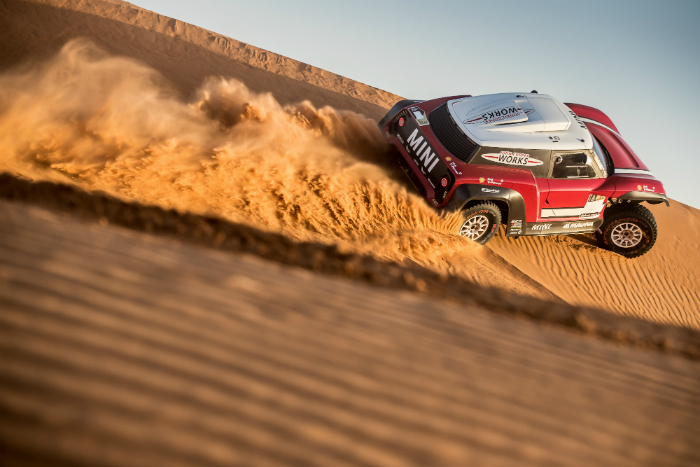 The MINI and X-raid range for the Dakar Rally 2018 will comprise seven cars and an experienced team of drivers and co-pilots. The three MINI John Cooper Works Buggies will be piloted by Mikko Hirvonen (FIN), Bryce Menzies (USA) and Yazeed Al-Rajhi (KSA). 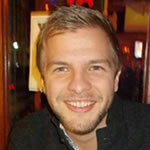 The driver seats in the MINI John Cooper Works Rally will be occupied by Orlando Terranova (ARG), Jakub Przygonski (POL), Joan “Nani” Roma (ESP) and Boris Garafulic (CHI). With this driver line-up and the crew of experienced organisers and technical and medical specialists, the X-raid Team will be perfectly equipped for the endurance ordeal awaiting man and machine at the 40th edition of the Dakar Rally. 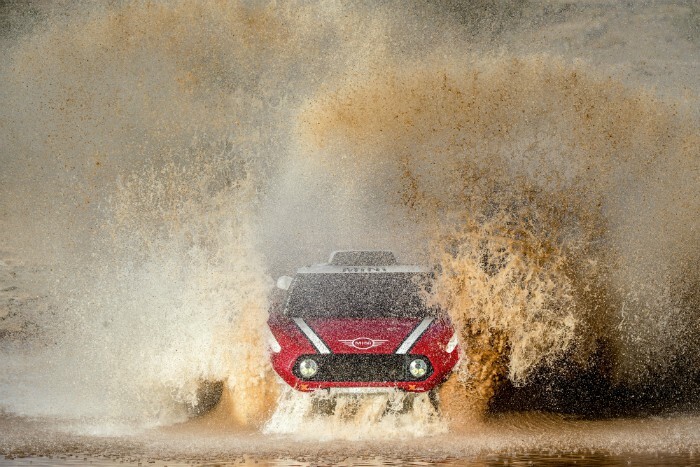 The anniversary edition of the long-distance rally, which is taking place in South America for the tenth time, will take the rally participants from Peru to Argentina via Bolivia. The 2018 Dakar Rally incorporates extended desert stages as well as rock and boulder fields and asphalt tracks which take the cars up to an altitude of 4000 meters in the Andes. The final stage will be completed on 20 January 2018 in Córdoba, Argentina.